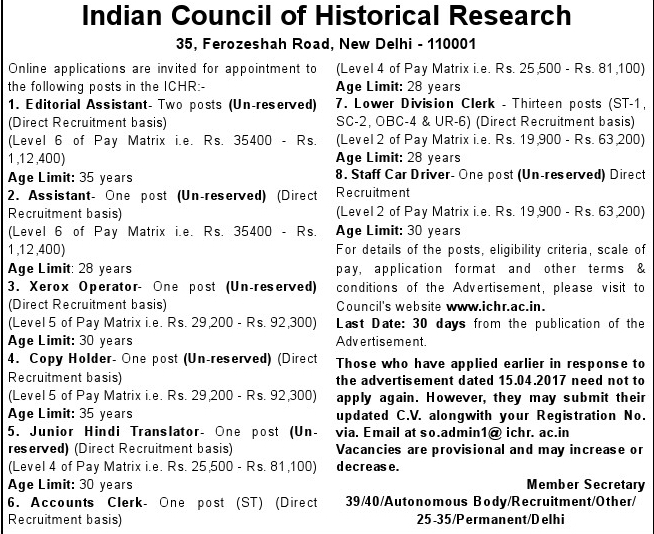 Indian Council for Historical Research (ICHR) Recruitment 2018 – Apply for ICHR 20 LDC, Staff Car Driver, Editorial Assistant, Xerox Operator, Copy Holder, Accounts Clerk, Assistant and Junior Hindi Translator Posts. ICHR 2018 Notification | Apply online for ICHR LDC Jobs 2018.The employment notification for the post of 20 ICHR LDC vacancies has been out for those who completed their Graduation degree. Indian Council for Historical Research has announced the job notification to invite the interested candidates for ICHR Recruitment 2018 for LDC Posts Eligible candidates can apply for the 20 ICHR vacancies before the last date of application submission 22/ Jan/ 2018. Candidate should have graduated with the understanding of computer applications like MS Office, Excel etc. and have proficiency in the English language. Candidates who are going to submit their application for ICHR LDC Jobs and are preparing for their written examination may check the complete ICHR LDC syllabus 2018. ICHR LDC Syllabus consists all the major subjects whose questions will be asked in the exam. The ICHR LDC Exam 2018 contains the objective type questions. You need to download the Indian Council for Historical Research (ICHR) Syllabus pdf 2018 before starting the exam preparation. The Syllabus for ICHR LDC along with the exam pattern will give the brief idea about the upcoming exam and help the candidate to obtain a better score on the written test. It is necessary for the candidate to study according to the ICHR LDC Syllabus as it is the major aspect that will help you a lot in your studies. The ICDS LDC written test contains distinct sections. There are only multiple type questions in the LDC Question Paper. Each section of the exam contains different marks with different weightage.